Click for larger image and my fabulous commentary! We live in a jacked up world. People are dumb. People are selfish. People are rude. People are disrespectful. And that’s just what I saw today while picking up the girls from school. It is really is beyond fathomable most days. The girls’ school does not have buses for the general population of kids. The kids either walk from the neighborhood or parents drop them off. The school is in a residential neighborhood. The school is on one side of the street (taking up a whole block) and there are houses across the street. The street in front of the school is marked “3-minute Loading Zone” with some room at one end for the buses that pick up the medically fragile kids who attend. Then there are two small lots marked for faculty/staff. 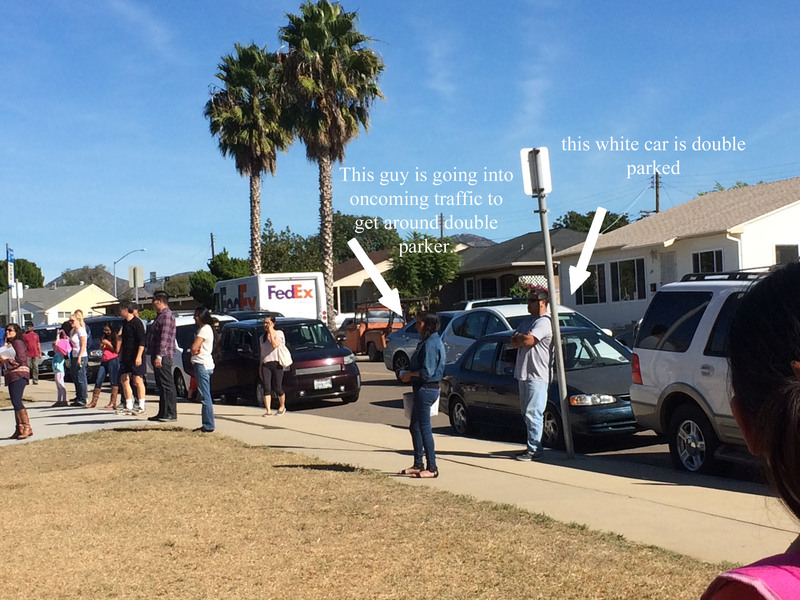 Parents are supposed to park across the street from the school or on one of the side streets surrounding the school. Sounds simple enough, huh? Yeah, well not so much. The Big One has been at the school for going on six years now (kinder- 5th grade) and I am still shocked most days by what I see each morning at drop off and each afternoon at pick-up. It really is hard to believe that people can be so plain stupid. They make U-turns wherever they feel like it along the block. They park in the loading zone. They park all over the faculty-staff lot (often blocking in other cars). They park in the red zone. 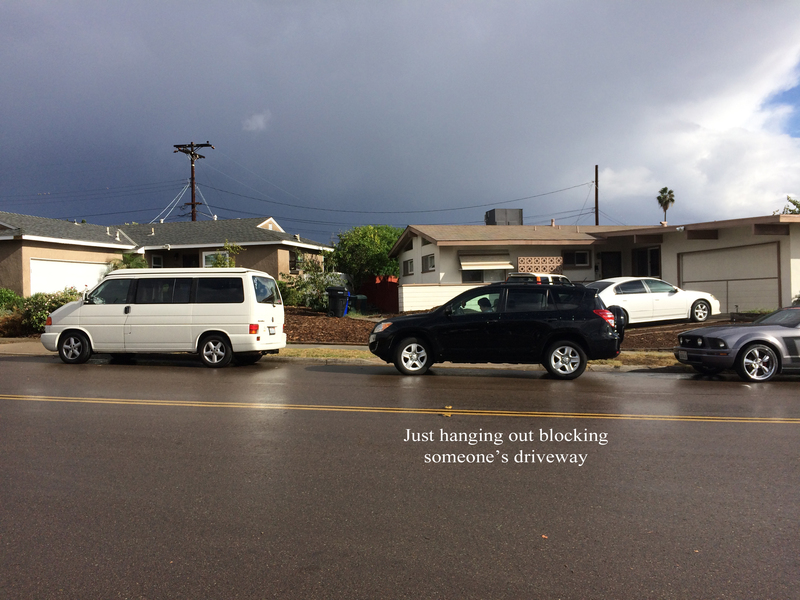 They block the residents’ driveways. They park in the two handicapped spots without handicap placards. They stop in the middle of the street and holler for their kids to run across the traffic to where they are blocking traffic in the other direction. If it wasn’t so dangerous it would be comical. So today, a woman whose child is wheelchair bound couldn’t park in the handicap spots because they were both full. One car had a placard, the other did not. So the woman parked in the fire lane to get her wheelchair-bound child and then went into the office to complain. The principal came out and stood by the illegally parked car waiting for the parent to return. Once the parent returned, the principal was respectful, yet firm while educating the woman about who can use handicap parking spaces. The woman, instead of swallowing her pride and admitting her mistake (or laziness) instead used some choice words to basically tell the principal that she could park wherever the heck she wanted. At this point, the poor kid was horrified and said, “MOM! That’s the principal!” Then the mom continued her 4-letter word tirade as she drove off with her 6 or 7 year old planted in the front seat of the car! What the actual hell is wrong with people? I should have taken a picture to add to my collection of stupidity, but I was just shocked by what I had witnessed. Click for larger image and my commentary! So for their Bronze Award, my 5th grade Girl Scouts have decided that they are going to try to fix some of this mess. We have a traffic engineer coming to talk to the girls at our next meeting. And we’ve made friends with a police officer who has been trying to come by and educate folks individually (both verbally and in the form of tickets) about what a “3-minute Loading Zone” actually means. But I am getting worried that no amount of education, enforcement, or signage can fix the problem of stupid people. Heaven help us all! Anyone had any luck fixing the traffic problems at their kids’ schools?